Canals are artificial channels for water. There are two types of canals: water conveyance canals, which are used for the conveyance and delivery of water, and waterways, which are navigable transportation canals used for passage of goods and people, often connected to existing lakes, rivers, or oceans. For canals used for water supply, see Aqueduct. Some canals are part of an existing waterway. This is usually where a river has been canalised: making it navigable by widening and deepening some parts (by dredging and/or weirs), and providing locks with "cuts" around the weirs or other difficult sections. In France, these are called lateral canals and in the UK they are generally called navigations, and the length of the artificial waterway often exceeds the natural. Smaller transportation canals can carry barges or narrowboats, while ship canals allow seagoing ships to travel to an inland port (eg Manchester Ship Canal, or from one sea or ocean to another (eg Caledonian Canal, Kiel Canal). At their simplest, canals consist of a trench filled with water. Depending on the stratum the canal passes through, it may be necessary to line the cut with some form of watertight material such as clay or concrete. When this is done with clay this is known as puddling. Canals need to be flat, and while small irregularities in the lie of the land can be dealt with through cuttings and embankments for larger deviations, other approaches have been adopted. The most common is the pound lock which consists of a chamber within which the water level can be raised or lowered connecting either two pieces of canal at a different level or the canal with a river or the sea. When there is a hill to be climbed, flights of many locks in short succession may be used. Prior to the development of the pound lock in 984AD in China by Chhaio Wei-Yo and later in Europe in the 15th century, either flash locks consisting of a single gate were used, or ramps, sometimes equipped with rollers, were used to change level. Flash locks were only practical where there was plenty of water available. Locks use a lot of water, so builders have adopted other approaches. 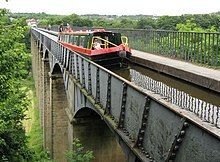 These include boat lifts, such as the Falkirk wheel, which use a caisson of water in which boats float while being moved between two levels; and inclined planes where a caisson is hauled up a steep railway. To cross a stream or road, the solution is usually to bridge with an aqueduct. To cross a wide valley (where the journey delay caused by a flight of locks at either side would be unacceptable) the centre of the valley can be spanned by an aqueduct - a famous example in Wales is the Pontcysyllte aqueduct across the valley of the River Dee. Another option when dealing with hills is to tunnel through them. An example of this approach is the Harecastle Tunnel on the Trent and Mersey Canal. Tunnels are only practical for smaller canals. Some canals attempted to keep changes in level down to a minimum. These canals known as contour canals would take longer winding routes, along which the land was a uniform altitude. Other generally latter canals took more direct routes requiring the use of various methods to deal with the change in level. Canals have various features to tackle the problem of water supply. In some cases such as the Suez Canal the canal is simply open to the sea. Where the canal is not at sea level a number of approaches have been adopted. Taking water from existing rivers or springs was an option in some cases, sometimes supplemented by other methods to deal with seasonal variations in flow. Where such sources were unavailable, reservoirs, either separate from the canal, or built into its course, and back pumping were used to provide the required water. In other cases water pumped from mines was used to feed the canal. Where large amounts of good are loaded or unloaded such as the end of a canal a canal basin may be built. This would normally be a section of water wider than the general canal. In some cases the canal basin contain wharfs and cranes to assist with movement of goods. The oldest known canals were built in Mesopotamia circa 4000 BC, in what is now modern day Iraq and Syria. The Indus Valley Civilization in Pakistan and North India (from circa 2600 BC) had a sophisticated canal irrigation system. Agriculture was practised on a large scale, and an extensive network of canals was used for the purpose of irrigation. Sophisticated irrigation and storage systems were developed, including the reservoirs built at Girnar in 3000 BC. In Egypt, canals date back at least to the time of Pepi I Meryre (reigned 2332 – 2283 BC), who ordered a canal built to bypass the cataract on the Nile near Aswan. In ancient China, large canals for river transport were established as far back as the Warring States (481-221 BC), the longest one of that period being the Hong Gou (Canal of the Wild Geese), which according to the ancient historian Sima Qian connected the old states of Song, Zhang, Chen, Cai, Cao, and Wei. By far the longest canal was the Grand Canal of China, still the longest canal in the world today. It is 1,794 kilometres (1,115 mi) long and was built to carry the Emperor Yang Guang between Beijing and Hangzhou. The project began in 605 and was completed in 609, although much of the work combined older canals, the oldest section of the canal existing since at least 486 BC. Even in its narrowest urban sections it is rarely less than 30 metres (98 ft) wide. The Naviglio Grande near Milan was the first artificial canal in Medieval Europe and the most important of the lombard “navigli”; started in 1127 and opened in 1257, allowing development of commerce, transport and agriculture. Canal building was revived in this age because of commercial expansion from the 12th century AD. River navigations were improved progressively by the use of single, or flash locks. Taking boats through these used large amounts of water leading to conflicts with watermill owners and to correct this, the pound or chamber lock first appeared, in 10th century AD in China and in Europe in 1373 in Vreeswijk, Netherlands. Another important development was the mitre gate which was probably introduced in Italy by Bertola da Novate in the sixteenth century. This allowed wider gates and also removed the height restriction of guillotine locks. To break out of the limitations caused by river valleys, the first summit level canals were developed with the Grand Canal of China in 581-617 AD whilst in Europe the first, also using single locks, was the Stecknitz Canal in Germany in 1398. The first to use pound locks was the Briare Canal connecting the Loire and Seine catchment areas in France (1642) followed by the more ambitious Canal du Midi (1683) connecting the Atlantic to the Mediterranean. This included a staircase of 8 locks at Béziers, a 157 metres (515 ft) tunnel and three major aqueducts. Canal building progressed steadily in Germany in the 17th and 18th centuries with three great rivers, the Elbe, Oder and Weser being linked by canals. In post-Roman Britain, the first canal built appears to have been the Exeter Canal, which opened in 1563. The oldest canal built for industrial purposes in North America is Mother Brook in Dedham, MA. It was constructed in 1639 to provide water power for mills. In Russia, the Volga-Baltic Waterway, a nationwide canal system connecting the Baltic and Caspian seas via the Neva and Volga rivers, was opened in 1718. The greatest stimulus to canal systems came from the Industrial Revolution with its need for cheap transport of raw materials and manufactured items. In Europe, particularly Britain and Ireland, and then in the young United States and the Canadian colonies, inland canals preceded the development of railroads during the earliest phase of the Industrial Revolution. The opening of the Bridgewater Canal in 1761, which halved the price of coal in Manchester, triggered a period of "canal mania" in Britain so that between 1760 and 1820 over one hundred canals were built. In the United States, navigable canals reached into isolated areas and brought them in touch with the world beyond. By 1825 the Erie Canal, 363 miles (584 km) long with 82 locks, opened up a connection from the populated Northeast to the fertile Great Plains. The Blackstone Canal in Massachusetts and Rhode Island fulfilled a similar role in the early industrial revolution between 1828-1848. The Blackstone Valley was considered the 'birthplace' of the American Industrial Revolution where Samuel Slater built his first mill. In addition to their transportation purposes, parts of the United States, particularly in the Northeast, had enough fast-flowing rivers that water power was the primary means of powering factories (usually textile mills) until after the American Civil War. For example, Lowell, Massachusetts, considered to be "The Cradle of the American Industrial Revolution," has 6 miles (9.7 km) of canals, built from around 1790 to 1850, that provided water power and a means of transportation for the city. The output of the system is estimated at 10,000 horsepower. Other cities with extensive power canal systems include Lawrence, Massachusetts, Holyoke, Massachusetts, and Manchester, New Hampshire. Competition from the railway network from the 1830s, and later the roads, made the smaller canals obsolete for commercial transportation, and most of the British canals fell into decay. Only the Manchester Ship Canal and the Aire and Calder Canal bucked this trend. But in other countries canals grew in size as construction techniques improved. During the 19th century in the US, the length of canals grew from 100 miles (160 km) to over 4,000, with a complex network making the Great Lakes navigable, in conjunction with Canada, although some canals were later drained and used as railroad rights-of-way. In France, a steady linking of all the river systems—Rhine, Rhône, Saône and Seine—and the North Sea was boosted in 1879 by the establishment of the Freycinet gauge which specified the minimum size of locks so that canal traffic doubled in the first decades of the 20th century. Many notable sea canals were completed in this period, starting with the Suez Canal (1869), and the Kiel Canal (1897), which carries tonnage many times that of most other canals, though the Panama Canal was not opened until 1914. Large scale ship canals such as the Panama Canal and Suez Canal continue to operate for cargo transportation; as do European barge canals. Due to globalization, they are becoming increasingly important, resulting in expansion projects such as the Panama Canal expansion project. The narrow early industrial canals however have ceased to carry significant amounts of trade and many have been abandoned to navigation, but may still be used as a system for transportation of untreated water. In some cases railways have been built along the canal route, an example being the Croydon Canal. A movement that began in Britain and France to use the early industrial canals for pleasure boats has spurred rehabilitation of stretches of historic canals. In some cased abandoned canals such as the Kennet and Avon Canal have been restored and are now used by pleasure boaters. In Britain canalside housing has also proven popular in recent years. The Seine-Nord Europe Canal is being developed into a major transportation waterway, linking France with Belgium, Germany and the Netherlands. Canals have found another use in the 21st century, as wayleaves along the towing paths for fibre optic telecommunications networks. An intersection of two canals in Amsterdam, The Netherlands. Canals are so deeply identified with Venice that many canal cities have been nicknamed "the Venice of..." The city is built on marshy islands, with wooden piles supporting the buildings, so that the land is man-made rather than the waterways. The islands have a long history of settlement; by the 12th century, Venice was a powerful city state. Amsterdam was built in a similar way, with buildings on wooden piles. The pace of draining of fenland and polder in the Low Countries quickened in the 14th century and canalization made the village of Amsterdam a port. It became a city around 1300. Other cities with extensive canal networks include: Brugge in Flanders, Birmingham in England, Saint Petersburg in Russia, Hamburg in Germany, and Fort Lauderdale, Florida in the United States. Inland canals have often have had boats specifically built for them. An example of this is the British narrowboat which is up to 72 feet (22 m) long and 7 feet (2.1 m) wide and was primarily built for British Midland canals. In this case the limiting factor was the size of the locks. This is also the limiting factor on the Panama canal where Panamax boats are limited to a length of 294.1 metres and a width of 32.3 metres. For the lockless Suez Canal the limiting factor for Suezmaxes is generally draft which is limited to 16 metres. At the other end of the scale, tub-boat canals such as the Bude Canal were limited to boats of under 10 tons for much of their length due to the capacity of their inclined planes or boat lifts. Most canals have a limit on height imposed either by bridges or tunnels. ↑ Hadfield 1986, p. 22. ↑ Calvert 1963, p. .
↑ Edwards 2002, p. .
↑ Hadfield 1986, p. 191. This page was last edited on ३ मे २०१५, at ०४:२०.